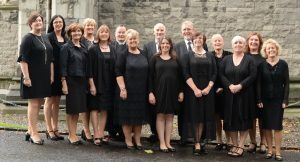 ATHY based choir In Cantorum, along with choirs from Portarlington, Clonaslee and Clonaghadoo, are to feature in the **Mass on Sunday** programme on RTÉ One television. Aifreann na Clainne (Family Mass) will be broadcast at 11am on Sunday 15 July. Portarlington-born singer, songwriter, pianist and composer Tom Conroy (Piano Man Tom) will bring together a 40-strong ‘family of choirs’ to debut his new Mass setting. The music was specially written to celebrate the World Meeting of Families, which will be hosted in Dublin for the first time this year. Bishop Denis Nulty of Kildare and Leighlin will celebrate the Mass. Hailed as his best work to date, Aifreann na Clainne is Tom’s third Mass setting and this will be his third appearance on the TV programme as a composer and musical director. However, bringing together members of four different choirs is a first. Tom explains that merging so many people into a large ‘family of choirs’ is symbolic. He says: “We’re all joined together through our love of music and we are passionate about sharing our faith through music. As well as talented family members, the RTÉ Mass will feature a performance from Orla Fallon, formerly of Celtic Woman and Anúna, who will sing ***Ár nAthair***, Tom’s composition of the Lord’s Prayer in Irish. Other guest soloists are soprano Kyra Fingleton and tenor Anthony McGorian. Tom is constantly writing new material and is also resident musician at the beautiful Ballyfin Demesne in Laois. The combined choirs will be conducted by Eileen Doyle from Athy’s In Cantorum.